iba Marktplatz: WANT TO IMPROVE YOUR PROFITABILITY? WANT TO IMPROVE YOUR PROFITABILITY? Solutions for a flexible and successful baking process. Welcome to our IBA booth in Fairground Munich to experience live baking and take part in inspiring discussions on how to integrate Revent equipment into a successful baking process. We are proudly introducing the extended range of the ONE series ovens, the ONE25 for trays 800x600 mm. 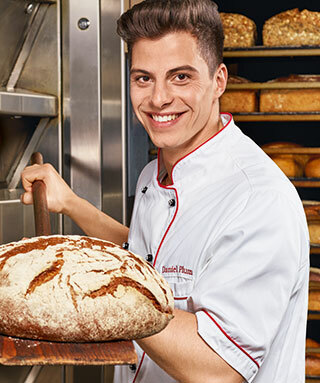 We will bake a variety of breads and pastries in the ONE series ovens. Bakers around the world have discovered the benefits of these. The round oven chamber gives a smooth airflow which contributes to a more even bake. It’s difficult to find a more flexible oven. We bake everything from German rye bread to macarons. You can also get a live demonstration of our unique Proving and Vacuum Cooling techniques. While you are there, why not sit down with one of our experts to see how you can improve your profitability. Over the years our equipment and understanding of the baking process has helped many bakeries to increase their productivity and sales. Add this to our commitment to all our customers — to ensure the lowest possible Total Cost of Ownership — and you have come one step closer to long term profitability. Help us to help you! You can set up an appointment in advance by contacting Marie-Louise Rydström, by email: mlr@revent.se, or mobile phone: +46 70 517 05 57. Empfänger auswählen ...Revent International ABAsa Sandell Bitte wählen Sie einen Empfänger aus. Weiterempfehlen von WANT TO IMPROVE YOUR PROFITABILITY?